I (Michela) first came across Valda on social media last year and was struck by her refreshing approach to landscape photography. She has a good eye for composition and is quickly establishing herself as a leading practitioner of I.C.M. (Intentional Camera Movement) and M.E. (Multiple Exposure) photography. I wanted to ask her to expand on the artistic journey touched on in Doug Chinnery’s article Creativity in Camera last September. When I contacted Valda she was in Namibia but kindly applied herself to the questions while seeking respite from the midday sun (not something we’ve had to worry about in the UK recently). I can remember from a very early age having a very strong need to be creative. I spent all my time drawing, painting and making things. I think it’s fair to say that my schooldays were not the happiest and I couldn’t wait to escape. I went off to art college for a brief time but looking back, I now realise I wasn’t emotionally ready to leave the safe surroundings of my home in Jersey for the substance-smoking, cheesecloth-wearing, crystal-carrying mindset that was the art school scene in London in the mid-1970’s. In retrospect it would have been a lot better had I waited a year. I first became properly involved in photography when I was about 16 or 17. My dad and I signed up for evening classes and learnt the basics with a Canon AE-1. We set up the obligatory darkroom in the downstairs loo and I had a lot of fun producing some truly unremarkable images. I don’t enter many competitions so I was quite chuffed to get a 2nd and a 3rd prize in the International Garden Photographer of the Year (Greening the City category) in 2013. I’ve just found out I’ve been given an award in the same category this year although I haven’t yet been advised what it is. However I don’t know if proud is the right word. To me, being proud suggests something that has been hard won or involved great effort - getting recognition in competitions is really only a case of what a certain judge likes on a certain day so clearly there is a huge element of luck and subjectivity involved. I think I need to clock up my 10,000 hours (at least) before I can even start to consider being proud of anything I’ve done. The afore-mentioned awards were for images made in the more conventional way - maybe if I ever get a multiple exposure image into the final rounds of any of the big ‘OTY’ competitions I might temporarily allow myself a brief glow. My first epiphanic moment was the week I spent in New York with street photographer, Jay Maisel five years ago. I had been bobbing around in the unchallenging shallows of Flickr for a few years and having long been an admirer of Jay’s use of colour and shape decided to treat myself when I turned 50. It does me no favours to admit that I set off for New York without fear or trepidation fondly assuming I could hold my own and happily mingle with a group of like-minded people. And so I turned up 10 days before Xmas to find I was the only woman amongst a group of 8 highly accomplished Alpha Male types - CNN camera men fresh from the Iraq war, professional photographers, movers and shakers and of course Jay himself, a super-confident New Yorker who takes no prisoners. Never did my status as middle-aged housewife from Sussex seem more painfully apparent! I must add that the problems were all in my head - the guys were lovely, but having never been called upon to offer up an intelligent critique of an image, the daily sessions around the huge boardroom table in the bank building where the workshops were held, saw me cowering at the back of the room. Needless to say ‘nice colours’ and ‘awesome image’ were not going to cut it here! By the second day I realised how out of my depth I was and came perilously close to throwing in the towel and running back home. I finished the week and learned a great deal - it boosted my confidence and opened my eyes to a different world. To be in such a creative environment and to have people such as Peter Turnley and Duane Michals come and speak is a memory I cherish to this day. I went back a couple of years ago for an Alumni week - this time the group dynamic was more diverse. It made me realise how much I had gained from the first week and bolstered my commitment. It was hellishly hard work - 12-14 hour days - but Jay is a wonderful teacher, raconteur and motivator and we all sat there soaking up information like sponges. The second light bulb moment was the day I came across Chris Friel’s work. At the time Jay’s influence was still strong and I was involved mainly in street photography. I felt it gave me more opportunity to capture a ‘moment’; something unique that I had assumed (incorrectly) wasn’t possible with landscape photography. Possibly because of my lacklustre travails at the easel, the images I saw of Chris’s with their abstract shapes and lack of extraneous detail just knocked me sideways. It didn’t take long to track down Doug Chinnery who was - and still is - running ICM workshops. I booked up a one to one with him - I think it was 2 1/2 years ago - and everything changed for me that day. I was lucky enough to meet Chris as well and both he and Doug have been so hugely kind and supportive of my efforts during the past couple of years. You’ve mentioned previously that landscape photography did not initially appeal to you. How is the relationship developing? I’d have to say pretty well - I’m totally committed to developing ideas and honing my vision. It’s very easy to rely on familiar techniques, views, compositions etc - although I don’t think change for its own sake is necessarily a good thing either. Hopefully any progress is more of an evolutionary process. I’m thinking a lot more about why I’m pressing the shutter and what I’m trying to say with my images. I’m also enjoying the challenge of working with projects rather than the single image although how viable that is when travelling I don’t know. I remain intrigued by portraiture and street photography however - the emotional impact that can be captured in a moment is something very difficult - if not impossible - to achieve in a landscape image. For me, anyway! Tell me about why you (now) love landscape photography? A little background on what your first passions were, what you studied and what job you ended up doing. Although I pressed on with street photography for many years, my personality is really not cut out for it. For me, the biggest problem is the issue of stealing an image with a long lens from across the street. As much as the ethics of this approach trouble me, I would still rather get root canal work done than bowl up to a complete stranger and ask if I can take their portrait. Even if I could get round this not-inconsiderable social stumbling block, I don't really have the knack or confidence to start directing people how to pose. Landscape photography gives me the chance to be out and about on my own with nobody to answer to. It can be a quiet and solitary place and offers up the opportunity for thought and contemplation. My life is not really geared up to chasing the light or the tides and I’m too lazy to lug a tripod around but fortunately my multiple exposure imaging seems to be quite compatible with such an undisciplined approach. When I was younger I spent some time in banking, went off to live in the U.S. for a few years, then finally ended up back in Jersey where I opened a shop selling clothes and handbags. I loved the creative side of it and learned a lot about shop and window display which seems to have many parallels with the rules of composition I refer to in my photography today. The commerce side of it was a bit more problematic - I struggled with the idea of taking large sums of cash from customers who had become friends and ended up giving away far too much discount to really make it a viable proposition. I closed the shop then moved to the UK about 20 years ago when I met my husband. I found myself in the fortunate position of not having to go out to work, so I resumed my painting for a while but it quickly became apparent that I didn't have the commitment/flair/talent - call it what you will - to produce anything I found even vaguely pleasing. Photography came back into my life about 8 years ago but it is only in the past 3 or 4 years that I have become totally committed to it. Your portfolio covers a wide range of locations in the UK and overseas. Do you prefer to photograph new places or those you are familiar with? I feel fortunate that my husband and I get to travel quite a bit so I am constantly experiencing new and unseen landscapes. Of course when you visit a foreign country you don’t have the same connection with an area you know intimately but I do enjoy seeing unfamiliar places - you just have to let instinct and spontaneity lead the eye rather than deep meditative introspection. I enjoy both approaches equally although the one big advantage of taking images while on holiday is that the demands on my time are few, so I can completely switch off and concentrate for longer periods of time. I do find myself having to explain myself quite a bit when traveling - other photographers hear the furious succession of shutter clicks and amble up to ask me about the strange bracketing technique I’m using. Mostly my explanations are met with blank incomprehension but a surprising number of people ask for my website address because they want to know more. To what extent are you able to envision the end result? One of the aspects of multiple exposure that I enjoy is the frequent surprises one sees. I’ve only been doing it for about 14 months but am gradually starting to be able to predict what a certain combination of variables might produce. When I’m out shooting (and indeed mostly when I’m not) like most landscape photographers I find myself looking for shapes and patterns; patterns interrupted, that sort of thing. I choose the settings I think will best convey what it is about a scene that has intrigued me. It might be a shape, a colour, an emotion, a message or a combination. On a good day I will come back with exactly what I was hoping for - or a close approximation. Most frustrating are the times when one gets really excited by what is on the back of the camera, only to get home and be desperately disappointed when the images are uploaded to the computer. I use my Canon 5d3 for 80% of my work because it offers me the option to combine up to 9 multiple exposures in camera with a variety of different blend modes. There are so many variables one can employ - blend mode, shutter speed, white balance to name but three - that I really am only just scratching the surface of the potential of my camera. I use fewer lenses these day and most of my images are taken with my 24-105mm. When travelling I usually take along a 70-300mm zoom as well. The tilt shift lenses I used to use to create blur with ICM seem less successful with multiple exposure for reasons that remain unclear at the moment. The blur is not attractively rendered in any of the blend modes that I am using, but it’s possibly the case that I haven’t given it enough practice. I have just bought the new Sony A7r because it has a multiple exposure app. It will only combine two exposures but it has a host of other options not offered by the 5D3 that I am currently having fun with. I do take an awful lot of images when I’m out and I find whittling the results down in Lightroom perhaps the most difficult part of the process. Even when I have narrowed down small selection of ‘keepers’ I spend quite a lot of time at my desk gazing vacantly into the middle distance wondering why the image in front of me is not working quite as I’d hoped. I have created a handful of presets that give me a springboard and I try a few out, see which if any work, then do a little fine tuning. The processing is pretty much limited to contrast, clarity and colour adjustments although most of the tweaking is done with the colour sliders - I enjoy seeing how the dynamic of an image can change by pushing the hue, saturation and luminance. I don’t have too many sleepless nights about cloning out an errant twig, but if anything major needs removing to improve the composition, I would rather consign the image to the trash and look elsewhere. I do use Photoshop but only very occasionally for things like afore-mentioned cloning. Some of your images have a certain darkness to them? Ha! I’d like to say it’s because I’m a deep thinker and the darkness comes about as a result of hours of navel-gazing and listening to Leonard Cohen. Actually I do listen to Leonard Cohen but I don’t think he’s the reason for any perceived darkness. When I used to paint I favoured strong contrasts, big colours and lots of black - I think it’s just the way I am, which is curious because it’s totally at odds with my personality. I really admire the measured restraint of the images made by Chris Friel and Doug Chinnery - I just can’t seem to do it myself. I print them at home on my Epson 4900. It’s a big old beast of a printer and I enjoy experimenting with different papers. Printing and profiling is a wide ranging endeavour however and my limited knowledge barely scratches the surface. I have reached the stage where I can reproduce with reasonable accuracy what I see on my screen, but I would dearly love to find the time to learn about the myriad alternative printing processes. I know there are plenty of workshops available and it’s fairly high up on my list of to-do projects. I am very lucky that I have so much time at my disposal to dedicate to my image making. Although I do have commitments I know for sure if I had a 9-5 job as many of my online friends do, I would not have progressed much beyond second rate images of dogs and sunsets. The quality of the work out there produced by people who only have a few hours here and there to dedicate to their photography never ceases to amaze me. I really believe there is a valid place for every approach. Many people get great pleasure from visiting a location and bagging 'the shot' (and if my local framing shop is anything to go by, the chocolate box image is exactly what most people want to look at). At the other end of the spectrum are the thinkers whose images are laced with concept and metaphor. I try to look at a diverse selection of imagery with an open mind. With the possible exception of HDR - we all need a bit of time on the artistic moral high ground don’t we? Chris Friel is an obvious inspiration. He has a wonderful resource on his website where he lists photographers who have inspired him. I think it runs to about three or four pages now and it is a fascinating place to browse. Others, in no particular order include Jay Maisel, Rob Hudson, Doug Chinnery, Sarah Moon, Fay Godwin, Susan Burnstine, Peter Scammell, Alexey Titarenko, Klavdij Sluban, Chris Tancock, André Kertész, Paul Kenny, Michael Jackson, Arnold Newman, Ernst Haas, Saul Leiter. I think I’d better stop there. I have many books on my shelves that I refer to often. The famous image of Stravinsky at the piano by Arnold Newman is one I love to look at for its purity of shape and line and perfect composition. It reminds me of the importance of these elements which I try to keep in mind when I’m out with my camera. I refer as much to painters as photographers - Cézanne, Matisse, Diebenkorn, Morandi, Chagall, Kandinsky, Rothko, Van Gogh, Klee…..sigh. Is it any wonder I’m confused? The odd thing is I am mainly driven by shape and colour, yet virtually all the images I have on my wall from photographers I admire are black and white so I don’t know what that’s all about. I’ve certainly tried to render my images in B&W but hitherto have failed miserably for reasons that remain shrouded in mystery. Such a hard question. I am usually drawn to images I have recently taken, then a week later they hold no appeal. I find I can only really be objective about images I have taken several months previously - probably because the emotional connection to the place has faded somewhat. The first image is one I took in Jersey - I still go over to visit my mother whenever I can. She lives high up in the wilds of St Ouen - a wonderfully remote and weather-beaten part of the island. When there’s a spring tide the Atlantic breakers come crashing over the wall and there’s no place like it. The Five Mile Road runs alongside this stretch of beach and the trees there bear all the scars of the ravages of time and tide. I have been trying for some time to make images of these trees that I am happy with and this is the first one I have produced that I find pleasing. Usually when I’m photographing trees, I use the dark blend mode on my camera but I decided to try to emphasise the bleached silver bark by using the bright mode. I find this mode fiendishly difficult with trees as small branches are often rendered in a messy and unappealing way. There’s certainly a chaotic tangle of twigs here, but I think it’s just about held together by the strong trunks. This image was taken on a trip to Avignon last September. I like the interaction between the fractured buildings and the spreading branches together with the harmonious colours. I used the dark blend mode with three or four exposures and moved the camera fairly dramatically during the sequence. A view of Tuscany in the autumn. As much as I would have liked to include an image from my recent trip to Namibia here, there hasn’t been enough of a time lapse to enable me to form an objective view about which - if any - are viable. I was in Tuscany last autumn and this image is still one of my favourites. The sky had that wonderful light you get just before a storm and I like the scratchy textures and the rich colours. I didn’t do much to this - a slight white balance shift and a square crop. I think it was three exposures combined in camera using the bright blend mode. I wouldn’t have any trouble filling my time. My kitchen garden is a sad and neglected place; I just about manage to produce the basics but all dreams I once had of creating a beautiful box-edged potager to waft around in eating peas straight from the pod on a June morning have long since evaporated now that photography consumes my life. I also used to be a very keen cook and producer of all manner of exotic sourdoughs - that creative endeavour has also been massively scaled down. I have a pile of books that I would like to read, poetry I would like to familiarise myself with and a desire to learn about bookbinding too. I would like to learn more about alternative printing. This probably goes hand-in-hand with the mastery of film photography. Realistically I don’t know if I will ever find the time. I often feel quite overwhelmed when I realise how little I know. I still enjoy street photography but I would really like to become more proficient at what I am currently doing - specifically honing my compositional skills and reducing the number of images I need to take in order to get one worth keeping. I think that’s going to keep me occupied for a good few years at least. Your images speak as paintings as much as photographs and you mention that you enjoy trying to push the boundaries of photography? I do, but I also sometimes wonder if trying to make photography something it’s not supposed to be is a pointless endeavour. The one issue that there’s no getting around with digital imaging is the absence of the hand of the artist and that frustrates me somewhat. As much as I enjoy printing my work, I find the end result is often slightly sterile. It’s the reason why I would like to investigate some alternative printing methods. How are you finding that your work is received given the dominance of conventional landscape photography and the UK’s slowness in recognising it as art? I don’t how one measures such things. If gaining recognition with multiple exposure images through competitions is the defining factor then my progress has been lamentably slow. However my website hits have increased measurably in the past 6 months and On Landscape has been very kind to me recently. The good people at TripleKite have invited me to contribute to their latest publication and I’m exhibiting with Light & Land in London in March. I also get some wonderful support from the friends I have online. I’m pretty sure I couldn’t have envisioned such exposure 12 months ago. Doug Chinnery has finally badgered me into doing a multiple exposure workshop with him next month and I think it sold out in a week, so I guess there must be a certain amount of interest in experimental techniques. I’m afraid I’m hard-wired to struggle with the promotional aspect of what I do - my whole family have the same issues in their chosen fields so I don’t imagine that’s going to change anytime soon. I have a major crisis of confidence even putting images on Flickr much of the time and I have yet to submit anything to a photography magazine. Many names that spring to mind have already appeared. I would suggest Terry Gibbins. His work has a quiet, considered thoughtful quality about it which I find appealing and I’m also enjoying his recent multiple exposure and ICM work. 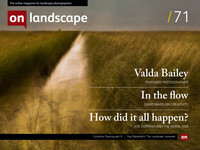 Many thanks to Valda for agreeing to be my first interviewee for On Landscape and for the thought she has put into her answers. I’d certainly recommend her website http://www.valdabailey.co.uk - the number and range of images in her portfolio definitely bears a closer look. You’ll also find her on social media flickr and @tanyards.